3 Carat Heart Shaped Diamond Engagement Ring. The epitome of romance, this heart shaped diamond engagement ring is a dazzling symbol of love. Presented here, this beautiful ring features a 3.03 carat center stone, framed by 2.06 carats of diamonds on the halo and custom split-shank. This captivating ring is set with unsurpassed craftsmanship in 18 karat white gold. 3 Carat Heart Shaped Diamond Engagement Ring. 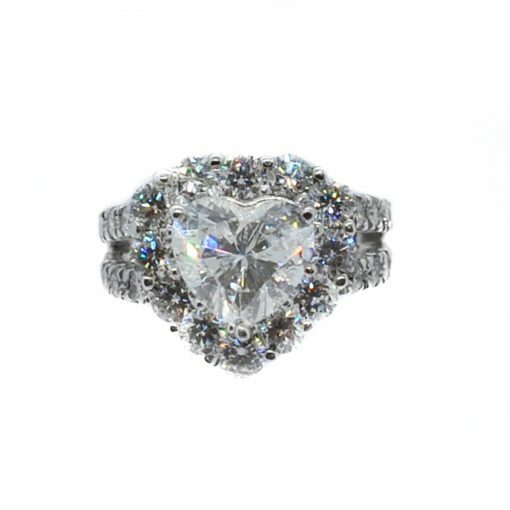 The epitome of romance, this heart shaped diamond engagement ring is a captivating symbol of love. Presented here, this beautiful ring features a stunning 3.03 carat center stone, framed by 2.06 carats of diamonds on the halo and custom split-shank. This stunning ring is set with unsurpassed craftsmanship in 18 karat white gold.